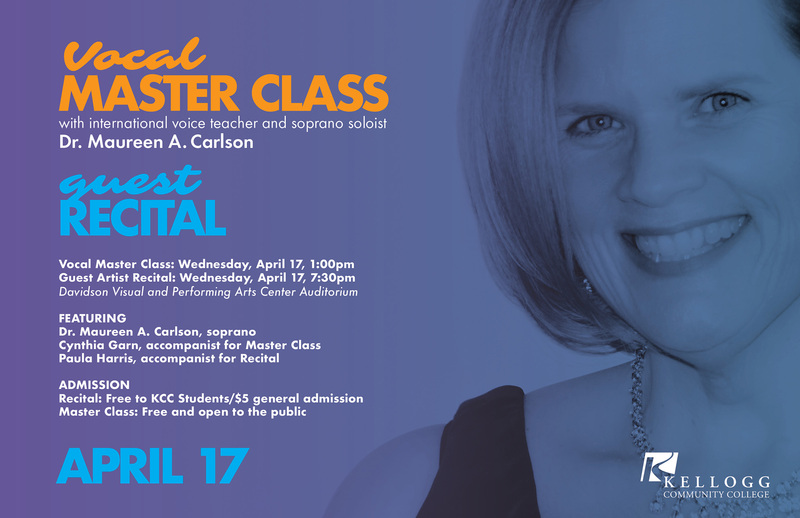 Kellogg Community College will open its 2019 Guest Artist Master Class and Recital Series April 17 with appearances from internationally recognized voice teacher and soprano Dr. Maureen A. Carlson. Carlson will coach up to five KCC voice students in an Open Student Master Class beginning at 1 p.m., and will perform during a Guest Artist Recital beginning at 7:30 p.m. Both events are open to the public and will be held in the auditorium of the Davidson Visual and Performing Arts Center, on campus at 450 North Ave. in Battle Creek. Admission to the Master Class is free; admission to the Guest Artist Recital is free for KCC students and $5 for the general public. “Although the focus is on the student, it’s a wonderful opportunity for those in the community who have an interest in singing to see the learning and teaching process up close and personal,” Case-Blanchard said. 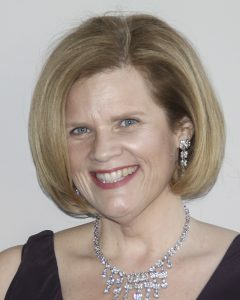 Staff accompanist Cynthia Garn will accompany Carlson on the piano during the Master Class. Carlson’s Guest Artist Recital will include a variety of works, ranging from classical art songs, opera arias and musical theatre to baroque selections and more. KCC keyboard faculty member Paula Krontz-Harris will accompany Carlson on the piano during the recital. For more information about this event, contact Case-Blanchard at blanchardg@kellogg.edu. Soprano Dr. Maureen Carlson is a professional singer, a member of the St. Louis Symphony Chorus, a professional cantor a St. Anselm Parish and the owner of Carlson Studios LLC. Carlson teaches music, art and culture in Bregenz, Austria, as a visiting professor through Michigan State University. She has also taught at the University of Missouri, Truman State University, the University of Michigan and Lindenwood University. Carlson received a Bachelor of Music in Education from Heidelberg University and a Master of Music in Vocal Performance and a Doctorate of Music in Vocal Performance from MSU. She is a proud member of organizations including the National Association of Teachers of Singing (and is a former NATS intern); the College Music Society; the National Association for Music Education; and the National Society of Collegiate Scholars. More information about Carlson is available on her website at www.carlsonstudiosllc.com.